A boy and his cat-bird. Hopes don’t get much higher than those for oft-delayed puzzle-adventure The Last Guardian. 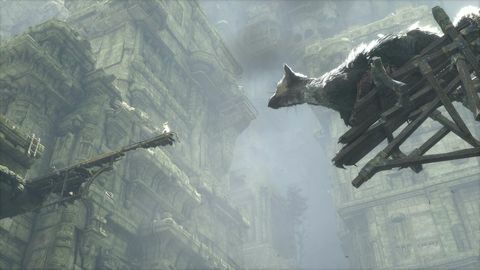 Known in Japan by the far superior moniker Trico, The Man-Eating Eagle, the game was feared to be vapourware, first surfacing in 2009 before sunking again, shifting studios, and finally emerging to a rapturous reception at last year’s E3. It has been nine long years, but suddenly The Last Guardian is only three months from release. And I’m here to tell you to temper your expectations. Although many key staff including Ico and Shadow of the Colossus lead Fumito Ueda are still actively working on the project, the 40 minutes I played at E3 today lacked the polish I expected to see in a marquee game hitting shelves as soon as October. Full disclosure and a possible relief for some: I thought Shadow of the Colossus was terribly overrated. A young boy awakes in a cave, and quickly discovers to his horror that a giant creature – seemingly a hybrid of a cat and a bird – is sleeping behind him. The creature is Trico, and it is visibly wounded and tethered to the ground thanks to a mighty chain and collar. After examining strange new markings on his skin, the boy grows courageous and attempts to free the gargantuan beast, and so begins the first puzzle of the game. 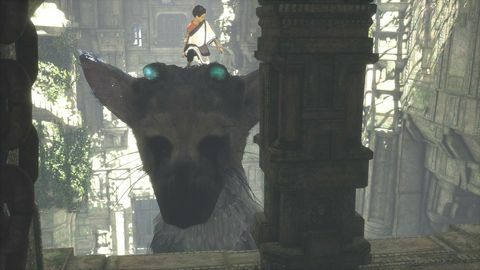 Our full E3 demo has the boy slowly gain the trust of Trico and lead it out of its makeshift prison, which is revealed to be a fortress of sorts built into the side of a mountain. Between those moments is standard puzzle-adventure fare: pull this, climb that, throw this. The only surprise is a shield-like item that can direct lightning from Trico’s tail onto any surface. The huge creature soon tolerates the boy climbing on him too, via a climbing mechanic that’s a direct copy of the unwieldy one in Shadow of the Colossus. Even when the boy isn’t clambering atop his new feathered friend, Guardian’s controls and camera are a bit of a mess. The boy’s animation is detailed, but input is laggy and imprecise, and the camera as it stands is fairly atrocious. It can be wrangled, but often only after you forcefully yank it from unenlightening angles or grapple with zooms that obscure the action – and that’s when there are no tight spaces around. This makes the minor amount of platform jumping required of the boy something of a hassle, and he often hitches on pieces of the environment, like he isn't properly in sync with the world. Often I knew exactly what I wanted to do to complete a puzzle, but the controls proved a time-leeching impediment. The great news is that Trico and the boy are easy to love. 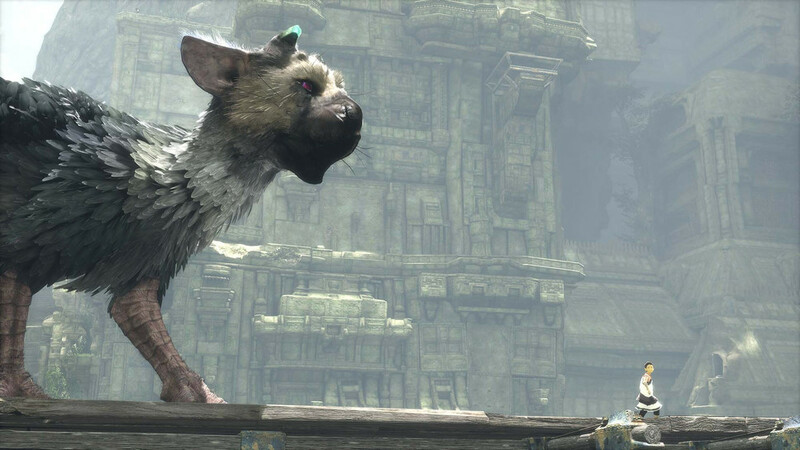 Both are extremely expressive, and Trico in particular is fascinating to watch. It shifts between skittish, frightening, curious, and timid, and the connection between it and the boy feels immediate and real. Its emotions are brilliantly conveyed, and as a player, your empathy is with this mythical creature from the outset. I’m not comfortable being this fond of an assemblage of pixels. Calling it to the boy and sitting on its head as it leaps to an out of reach platform are moments of pure exhilaration. Sporadic, gentle narration suggests that The Last Guardian's story is being told by an old man to an unknown listener, and the voiceover really adds to the game’s atmosphere. This is a grand adventure, softly told, but with real dangers and moments that will tug at your chest and form a lump in your throat, there’s no doubt about that. Our extraction from the fortress is tinged with grief, or at least foreboding; “I did not know that this was the Den of Beasts,” the man says heavily at the moment of our escape, and my stomach quickly tightens. So the heart of the game is there at the very least, and that’s probably the important thing. Gamefeel is a tangible problem, a calculus puzzle to be solved. The Last Guardian’s true ambitions concern something grander and more elusive; to unfurl a fable, and to rouse emotion within the player. On those terms, it will no doubt succeed. Hopefully this isn't a psych-out.